Jane Barthès was born in Nigeria to a fiery and passionate Catalan, French father and a reserved English mother. This inherited duality has strongly impacted her work as an artist as she grapples with the concept of relationships between all things; the ebb and flow between matter and energy, the clash between chaos and order and the struggle to find clarity and harmony in a world filled with uncertainty. Moreover, Barthès has always been fascinated by the concept of space, carving into it and taming it to find order. Barthès has traveled and lived many lives around the globe. After graduating in 1994 from Wimbledon School of Art at the University of London, she left the UK to spend a decade living and working in the South of France where she established herself as an abstract artist in London and France while also teaching life drawing and designing sets for the theater. In 2005, curiosity and a desire for change lead her to travel to New Mexico, US, where the extremes of the desert inspired her work for a few years before the recession set in. 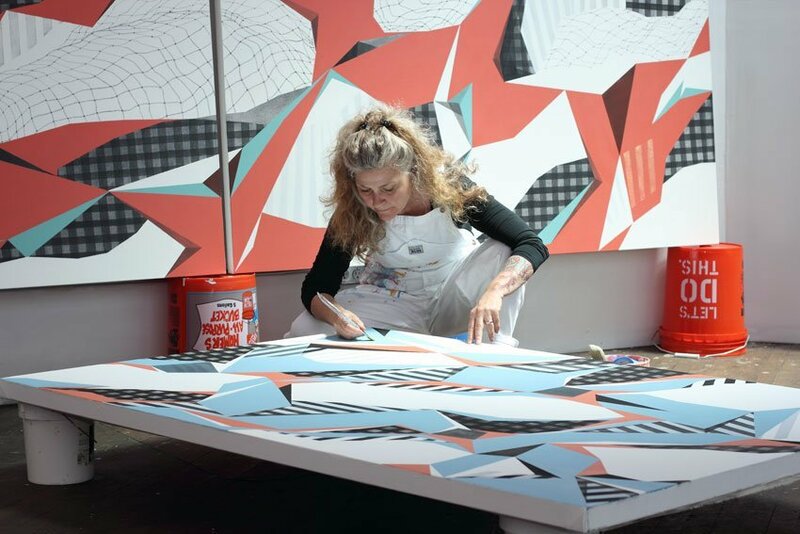 Barthès then moved to Chicago in 2009 where she is currently in her studio full time, working on her exploration of what she calls her “molecules” of energy now deeply informed and inspired by the architectural beauty of the city she now calls home. “Molecules of Architecture”, 737 Michigan Avenue, (Nieman Marcus Building); June – September.